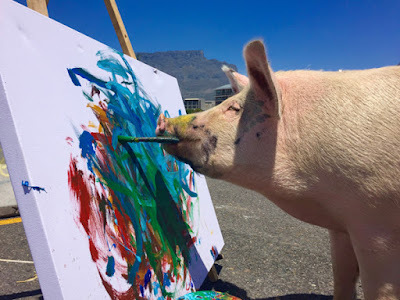 Pigcasso is a 450lb pig in Cape Town, South Africa. She was rescued from the slaughterhouse by Joanne Lefson. Ms. Lefson introduced Pigcasso to paint and brushes, and trained her with strawberries as the reward. Now Pigcasso seems to enjoy wielding the brush. Her tastes tend toward abstraction, with an energetic and gestural sense of mark-making. 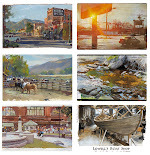 Lefson says Pigcasso likes to paint landscapes beside the ocean and that she signs her work at the end by dipping her nose in white paint and dabbing the finished canvas. Folks are going hog wild for Pigasso’s work. Swine not?! Art is art is art. Thus, bringing in the bacon for Ms Lefson. I'd like to see more of Pigcasso's finished pieces. And, who selected the colors - were they swapped out by the human? I can't tell from the video. Susan, those are good questions, and it is fascinating to try to find out what level of satisfaction the pig may be getting from it. We're not seeing the trainer conditioning the pig with treats and snacks, and we're not seeing the color changes. I presume that pigs would be red-green color blind, but they'd see light and dark of course and also blue vs. orange. The elephant-painting videos raise similar questions. Some trainers, while admitting it's a trained behavior, say that they really do enjoy making marks on paper. 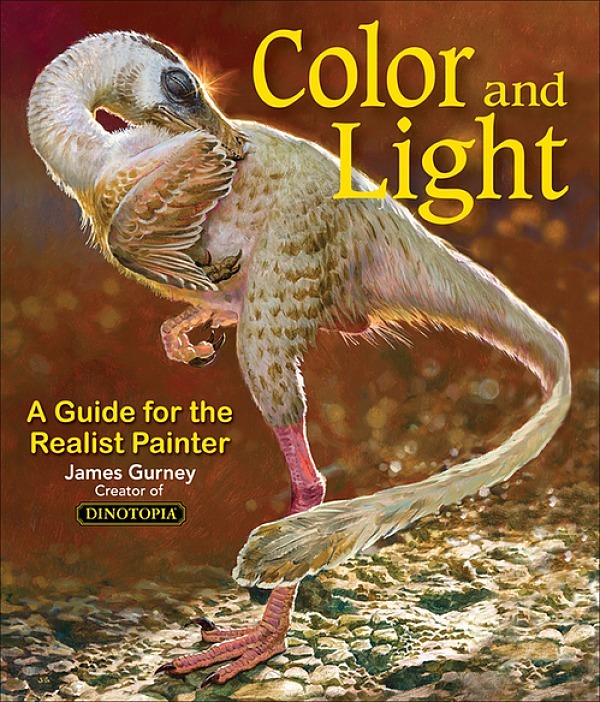 The links at the end of the post lead to other stories of animals who paint. I find that my own painting improves considerably when I'm given treats. Looks like Damien Hurst and company are being given a run for their money by Pigcasso! This kind of technique has far advanced since Barnard's first successful attempt: The difficulty lies in availability - there are too many patients waiting for a transplant versus insufficient supply. Am I veering completely off topic? Not quite, I would say: There's intense research going on to get over that shortage: A pig's heart would nearly match the human anatomy, they found out, very close - it might do the "pumping-job". Don't know; but a first transplant of this sort seems to be imminent. So why shouldn't Pigcasso paint ? Those pictures on the link strike me as inferior (immature), compared to elephant-made artwork I've seen in a magazine article years ago. If I come across it again, I might scan it for you. An elephant's artwork being superior to a pig's? Of course you're not an art critic, but a wholly accomplished Artist. Years back, I was in the middle of a promising watercolour painting, which was on our dining room table. While I was waiting for the first wash to dry, I popped into the kitchen to make a cup of tea. On my return I discovered our cat was sitting right in the middle of it. The painting was past saving. Question is, was she trying to improve it or was it just a critique?